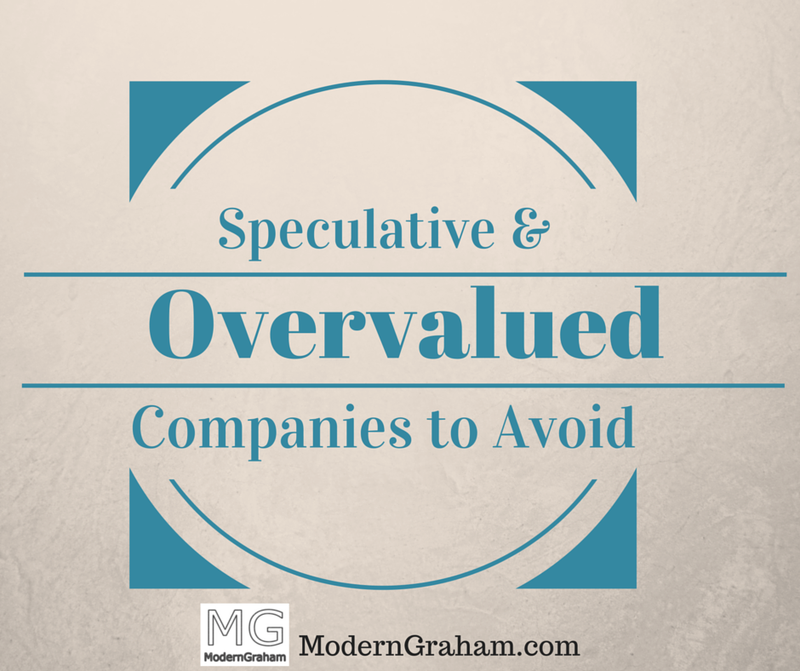 Each company has been determined to not be suitable for either the Defensive Investor or the Enterprising Investor according to the ModernGraham approach. Defensive Investors are defined as investors who are not able or willing to do substantial research into individual investments, and therefore need to select only the companies that present the least amount of risk. Enterprising Investors, on the other hand, are able to do substantial research and can select companies that present a moderate (though still low) amount of risk. Each company suitable for the Defensive Investor is also suitable for Enterprising Investors. Netflix Inc. does not qualify for either the Enterprising Investor or the more conservative Defensive Investor. The Defensive Investor is concerned by the low current ratio, lack of dividends, and high PEmg and PB ratios. The Enterprising Investor has concerns with the lack of dividends and lack of earnings growth over the last five years. As a result, all value investors following the ModernGraham approach based on Benjamin Graham’s methods should explore other opportunities at this time or proceed with a cautious speculative attitude. Molson Coors Brewing Co. does not qualify for either the Enterprising Investor or the more conservative Defensive Investor. The Defensive Investor is concerned with the low current ratio, insufficient earnings growth over the last ten years, and the high PEmg ratio. The Enterprising Investor is concerned by the level of debt relative to the current assets and the lack of earnings growth over the last five years. As a result, all value investors following the ModernGraham approach based on Benjamin Graham’s methods should explore other opportunities at this time or proceed with a cautious speculative attitude. News Corporation does not qualify for either the Enterprising Investor or the more conservative Defensive Investor. The Defensive Investor is concerned with the short history in its most recent business structure, and the high PEmg ratio. The Enterprising Investor is concerned by the insufficient earnings stability over the last five years and the lack of dividends. As a result, all value investors following the ModernGraham approach based on Benjamin Graham’s methods should explore other opportunities at this time or proceed with a cautious speculative attitude. Brown-Forman Corporation does not qualify for either the Enterprising Investor or the more conservative Defensive Investor. The Defensive Investor is concerned with the insufficient earnings growth over the last ten years, and the high PEmg and PB ratios. The Enterprising Investor is concerned with the lack of earnings growth or stability over the last five years. As a result, all value investors following the ModernGraham approach based on Benjamin Graham’s methods should explore other opportunities or proceed with a cautious speculative attitude. Staples Inc. does not qualify for either the Enterprising Investor or the more conservative Defensive Investor. The Defensive Investor is concerned with the low current ratio, insufficient earnings growth or stability over the last ten years, and the high PEmg ratio. The Enterprising Investor is concerned with the lack of earnings growth or stability over the last five years. As a result, all value investors following the ModernGraham approach based on Benjamin Graham’s methods should explore other opportunities or proceed with a cautious speculative attitude.